The MI106 smart alarm from Universal Security Instruments is a 2-in-1 system that provides protection against smoke as well as fires. The alarm uses Ionization Technology to protect against fast flaming fires. 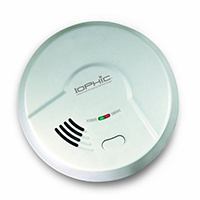 This 120V alarm is ideal for both replacement and new installations. Installation is easy, as the bracket can be mounted onto a standard wiring junction box. It is great for use in apartments, houses, and mobile homes. The 9-volt back-up battery will provide comfort even during a power outage. © 2018 Conservation Mart, LLC. All rights reserved.